Meagan Adele Lopez has always been on the move. By the time she was 12, she had lived in 12 places within the U.S. As a young adult, she moved to Paris and then Bristol, UK. She repatriated to the U.S. but recently crossed The Pond again to settle in London. Meagan’s talents include actress, blogger (she kept the blog “The Lady Who Lunches” while in Bristol), novelist and social media guru. And now, for the Displaced Nation audience, she will deliver advice on writing a novel. 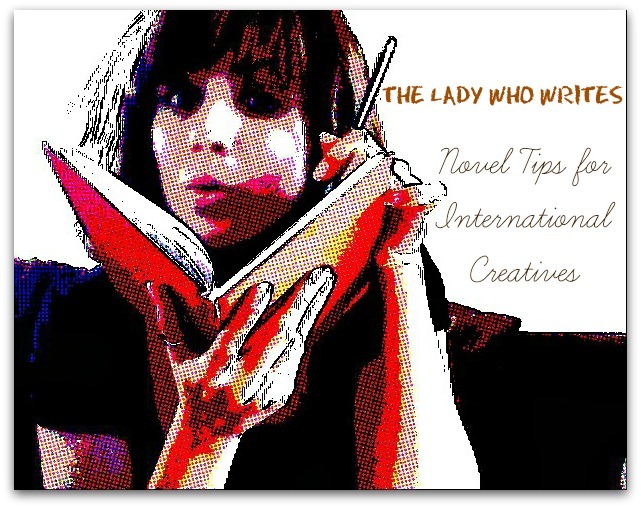 Introducing…THE LADY WHO WRITES! When ML Awanohara asked me to write a series of guest posts about writing a novel, I was a bit taken aback. Who am I to tell you lovely readers how to write a novel—I’ve only written one, and it wasn’t a bestseller on the New York Times! Then I started thinking about what I could contribute to the Displaced Nation, what I know I did really well, and what I know I didn’t do well. Surely the successes and learnings from any first-time author are worth a contribution of, say, a series of at least six guest posts? After all, I did have 30,000 people download the book in the first six months—that’s worth something, right? Plus, being an expat myself (this is my third try! ), hopefully I will be coming from a perspective that you all know and understand. I was lucky enough to be able to write my novel, Three Questions: Because a quarter-life crisis needs answers, while living abroad in England back in 2008. I’m back in England again (London, to be specific) after living in Chicago for three years—and, yes, I’ve started writing again. Do you feel this way at all, fellow expats? We all need inspiration in order to write, and for me that comes when I’m put in situations that are out of the ordinary. So, this blog series won’t be about telling the musts and mustn’ts of novel writing in a step-by-step manner. We all have a different method, and there is no right/wrong way. Rather, this column will provide six things to think about before, during and after writing a novel that maybe you’ve thought about, maybe you haven’t. I hope you will find my ideas inspiring, and never boring! Readers, any questions for our new monthly columnist, THE LADY WHO WRITES? Anything in particular you would like to see her cover in her series? STAY TUNED for Meagan’s first piece of writing advice, scheduled for tomorrow! Wedding celebrations: Who does it better, Britain or America? Definitely – it never occurred to me how much my juices started flowing living abroad until I moved back home the 2nd time from living abroad. And it was like all the steam was deflated from my creative balloon! So bizarre – there must be ways to get it back, but I know that right now I don’t want to find out.